The Sensors API provides access to raw sensor data streams from sensors available on the Android device and from sensors available in companion devices, such as wearables. The Recording API provides automated storage of fitness data using subscriptions. Google Fit stores fitness data of the specified types in the background and persists app subscriptions. Figure 1: Google Fit on Android. The History API provides access to the fitness history and lets apps perform bulk operations, like inserting, deleting, and reading fitness data. Apps can also import batch data into Google Fit. The Sessions API provides functionality to store fitness data with session metadata. Sessions represent a time interval during which users perform a fitness activity. The Goals API provides a way to track the goals the user has set for their health and fitness progress. The Bluetooth Low Energy API provides access to Bluetooth Low Energy sensors in Google Fit. This API enables your app to look for available BLE devices and to store data from them in the fitness store. The Config API provides custom data types and additional settings for Google Fit. For more information, see Custom Data Types and Disconnect from Google Fit. Google Fit includes support for sensors on the mobile device and Bluetooth Low Energy sensors paired with the device. 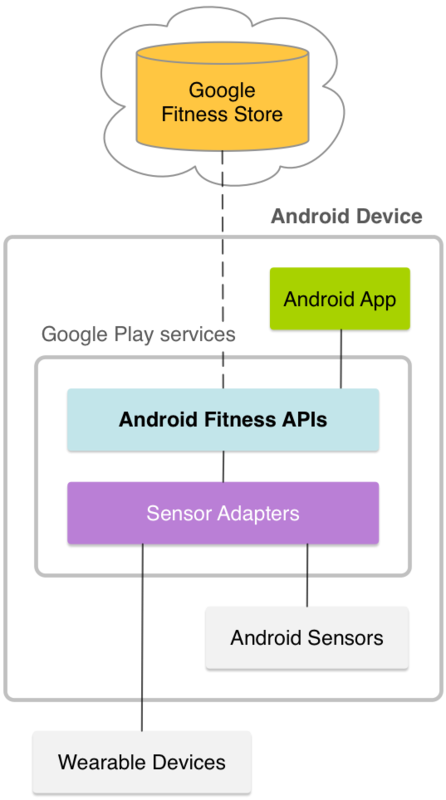 Google Fit lets developers implement support for other sensors and expose them as software sensors in Android apps. Sensors supported by Google Fit are available to Android apps as data source objects.